"Lightweight construction, durability, price tag and size...easy to fold down for storage or travel and can be set up without a single tool." "A safe, secure and affordable tool for potty training or behavior training, and...a comfortable place to chill out." "Designed for smaller sized dogs...features a single door design with a slide-bolt lock for safety and security." "All-steel, high tensile strength wire welded into a tight mesh pattern, ultra-durable crate is ideal for larger dogs." "Available in six different sizes and comes with an adjustable divider, so you can customize the perfect fit for your dog as she grows." "Foldable, fabric crate for comfier car rides and overnight stays with family or at hotels and campgrounds." "Made of hevea wood, this crate can double as an end table or simply blend in with your regular furniture." With over 17,000 positive reviews, it’s obvious that pet parents love MidWest Homes for Pets’ folding metal crate. They tout its lightweight construction, durability, price tag and size (one reviewer shared that her two Great Danes like to hang out inside one crate together!). Made with lightweight, yet durable gauge wire, this crate is easy to fold down for storage or travel and can be set up without a single tool. Safety features include two doors for ease of access and exit, two heavy-duty slide-bolt latches on each door and rounded corners to avoid bumps and bruises to you and your dog. It also has a removable, easy-to-clean base in case of accidents. Be sure to measure your dog — and consider his predicted full-grown size — when purchasing your crate. Available in seven different sizes, ranging from extra small to extra, extra large, this crate can accommodate virtually any sized dog. This crate comes with a one year manufacturer’s warranty, so if you’re unhappy with your purchase, contact them for a resolution. Designed for both puppies and full-grown dogs, this crate from AmazonBasics is a safe, secure and affordable tool for potty training or behavior training, and can provide your pet with a comfortable place to chill out. Available in single and double door options, as well as six different sizes, you can customize this crate to suit your dog’s needs. Two slide-bolt latches on each door make this crate safe and secure, while its wire composition provides strength, ventilation and visibility for your dog. It comes with a removable, composite plastic pan, so clean-up is super simple. You don’t need tools to set up or break down this crate, making it easy to transport and store, even in the smallest spaces. Heads up: Although this crate has nearly 6,000 positive customer reviews, some reviewers feel it could be slightly more durable. Need a safe space for your small pup? This crate from Carlson Pet Products is designed for smaller sized dogs — the manufacturer recommends it for dogs 25 pounds and under — and has a small price tag to match. Made from durable steel, this crate features a single door design with a slide-bolt lock for safety and security when you’re on-the-go … or just can’t keep an eye on your dog. It’s super lightweight and portable, making it ideal for travel. Plus, it folds flat for easy storage. Fully assembled, this crate is on the smaller side — measuring 24” x 18” by 19” — so be sure to measure your pet before making your purchase. Produced with an all-steel, high tensile strength wire welded into a tight mesh pattern, this ultra-durable crate from OxGord is ideal for larger dogs that need a little extra space to stretch out. This crate features two doors for easy access or exit, cleaning and bed making, as well as two slide-bolt locks for your dog’s safety and security. Clean-up is simple with a removable, washable plastic pan that catches water or food spills, or the occasional accident. When broken down, this crate measures less than four inches wide, making storage—even in tight spaces—easy. Not sure if your dog will fit? The manufacturer recommends choosing a crate that’s at least four to six inches longer and taller than your dog, so she has plenty of space to move around. 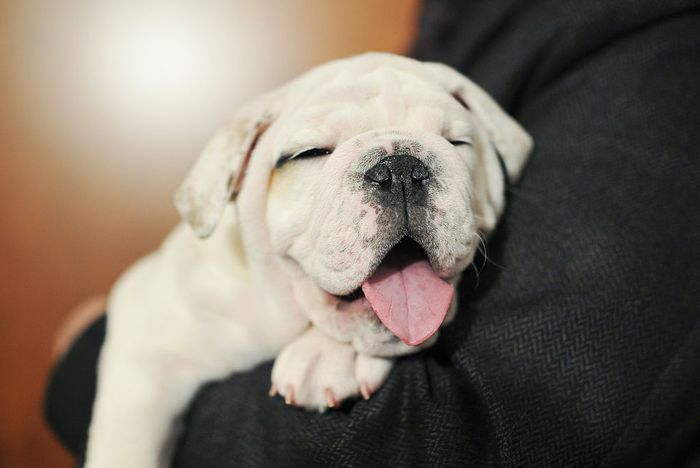 If you’re bringing home a new puppy (lucky, you!) check out this pick from MidWest Homes for Pets. It’s available in six different sizes and comes with an adjustable divider, so you can customize the perfect fit for your dog as she grows. That means you’ll never have to replace your crate, even when she reaches her full-grown size. This crate is constructed with heavy-duty gauge steel and has a tighter mesh design that makes it super strong, so your dog can’t chew through it. Plus, its tight weave and locking bolts can help deter those escape artist pooches. Real-life reviewers love this crate for its sturdiness, double doors for easier access and wallet-friendly price tag. If you and your pet travel frequently, you might want to invest in a foldable, fabric crate for comfier car rides and overnight stays with family or at hotels and campgrounds. This crate from EliteField has over 2,700 positive reviews — so you know it’s a favorite of jet-setting pet parents. This crate’s frame is constructed with lightweight steel, so it’s extra strong but easy to transport. Its upholstered with durable 600D fabric and features three mesh doors (on the top, front and side) for easy access or exit, ventilation and visibility, pockets to store your pet’s favorite toys and carrying straps. Plus, it comes with a free carrying bag and washable fleece bed, so your dog can feel extra comfy on the road. Available in five different sizes and 13 different colors, you can find the right crate for any sized dog. The manufacturer offers a two-year warranty. If you’re unhappy with your crate, contact EliteField for a 100% refund. If your dog isn’t so big on chewing and you think metal crates are an eyesore, check out this pick from Casual Home. Made of hevea wood, this crate can double as an end table or simply blend in with your regular furniture. 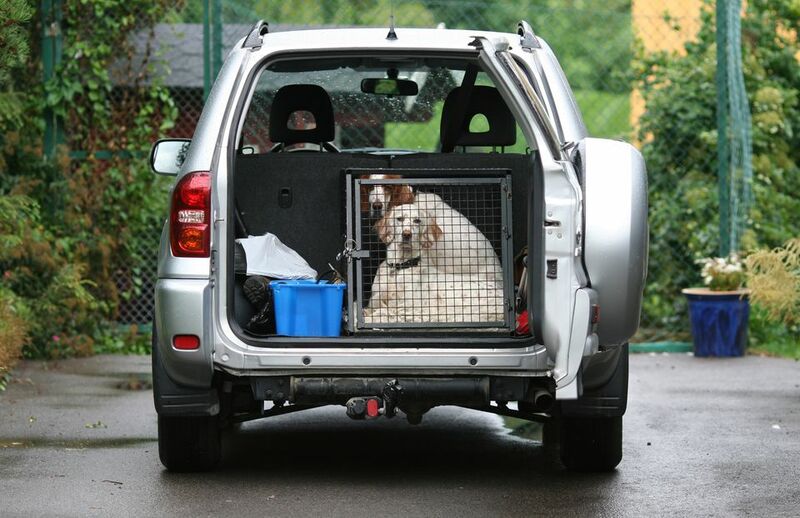 This crate comes in two sizes: Small can accommodate dogs up to 20” long and 14” tall, while the large is designed for dogs up to 38” long and 29” tall. Its slatted design provides ventilation and visibility, and its latching door will keep your pet safe and secure. It doesn’t come with a removable tray for spills or accidents, so you may want to consider adding a removable, water-proof lining for easier clean-up.